In predictable fashion, the GOP establishment joined a witch hunt at the behest of their liberal mainstream media masters to throw pro-border wall Rep. Steve King (R-IA) under the bus for defending Western Civilization. GOP leaders including two-faced coward House Speaker Kevin McCarthy (R-CA) hope that his constituents will boot King in 2020. 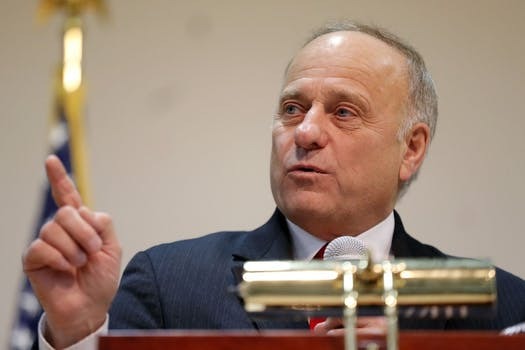 King’s unabashedly nationalist views particularly on immigration have made him a thorn in the side of globalist Republican paymasters who desperately want Trump to be as ineffectual of a President as possible before he can be replaced with some puppet who will return to the status quo. However, it will not be easy for the GOP’s controllers to get rid of King because he is beloved by the people. The people of Iowa know that King is a patriot who cannot be bought. He was greeted with a much-deserved hero’s welcome in his first public appearance in Iowa since he was sold out by sackless traitors in his own party. Although the Judas Iscariot clones of the Republican Congress lack resolve and patriotism and will happily sell out their countrymen for 30 pieces of silver, King is nevertheless emboldened by the fall-out. After all, you don’t get flak unless you are over the target! If the globalist b-stards end up getting him, King will go down swinging until the bitter end. He still has plenty of support in Iowa. Even though @SteveKingIA expected “potentially volatile” Primghar town hall, nothing over 60 mins neared rebuke, many aired “hang in there congressman” theme. Attendee at town hall tells Steve King: "We support you, we love your conservatism, and we hope they never silence you. We need you." It’s going to be hard to dethrone the King of Iowa. If the hapless GOP establishment keeps working with liberals against him and turn him into a martyr as a result, King may re-emerge more powerful than ever as Western Civilization continues to collapse. Anyone else feeling Steve King/Alex Jones 2024?